Genocide survivors seen perusing through an old album which was discovered in the grave to see if it belonged to one of theirs. 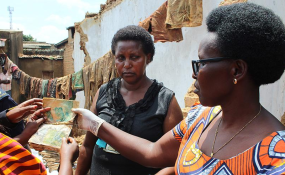 "The exercise is ongoing as we have identified four mass graves and we are yet to start exhuming three others, the information we have is that many people were dumped in these mass graves," said Théogene Kabagambire, Ibuka president in Gasabo. "I have information that both my parents were killed and dumped in one of mass graves here and I came with hope that I can identify the clothes they were wearing when they left. I wish to be sure that they are here so that I give them a decent burial," said Isabelle Uwimana, one of survivors.